As the world's population moves towards urbanisation, an international research team involving Queen Mary, University of London, has begun to unlock the factors driving the growing phenomenon. The study, published in the Nature journal Scientific Reports, examined almost 200 years of data on the evolution of the road network in an area north of Milan, called Groane. Co-author Professor Vito Latora, from Queen Mary's School of Mathematical Sciences, said: "Urbanisation is a complex phenomenon that affects our society and shapes the environment where we live. "The proportion of the world's population living in urban areas has recently grown beyond 50 per cent, and is expected to increase even faster in the near future. However, a quantitative assessment of urbanisation processes has been lacking." The multidisciplinary team of mathematicians, physicists, computer scientists, and urbanists used a unique database to study the growth of road networks in a large urban area over a long period of time. 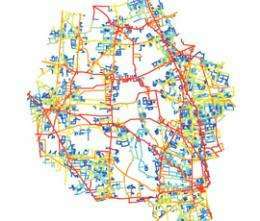 They used the quantitative tools of network theory to examine the evolution of road networks, which are one of the long lasting elements of urban forms and are considered a fundamental driver in urban development. "Our study of Groane shows that over time, cells of land demarcated by roads have become more evenly distributed and square shaped," Professor Latora said. "We found a general trend towards a greater number of four-way road junctions, compared with the earlier structure where dead ends and three-way junctions were more common." The most central streets in the network in 2007 tend to coincide with the oldest ones, highlighting the importance of central roads as a robust spatial backbone that remains stable over time. The study suggests that the evolution of road networks is driven by two key elements: exploration  whereby new roads trigger spatial evolution beyond the outskirts of the town  and densification, or the increase in local road density around existing urban centres. Professor Latora adds: "Exploration is more common during earlier historical periods, whereas densification predominates in later years. "We think our study will be useful for urban planning, geography and network science, and could open the way to further developments in urban theory." More information: 'Elementary processes governing the evolution of road networks' will be published in the journal Scientific Reports on Thursday 1 March 2012.